Winter Lettuce is one of my favorite crops for fall planting even though it doesn’t yield a harvest until the following spring. The name is a bit deceiving because this isn’t a single plant variety, and it isn’t a crop that is harvested during winter, at least that isn’t how I use it in my garden. I treat Winter Lettuce similar to the way that I grow garlic, it’s planted in late fall and allowed to over winter as a juvenile plant in order to get a huge jump on the spring growing season. It doesn’t require much space in the fall garden as the seed is sown thickly and the plants are crowded together in a garden bed or cold frame over the winter. 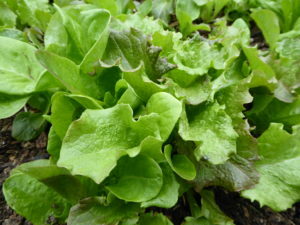 These types of lettuce varieties are super hardy, and because the plants are young and small they are able to easily endure even bitterly cold winters here in Central Pennsylvania. I usually broadcast the seed thickly over a four by four foot area during October or November. The seed will germinate and begin growing during the fall but will not attain any significant size going into the winter months. Once the ground begins to freeze I will place a cold frame over the patch to offer a little protection to the plants. But more commonly Winter Lettuce plants are covered with a light layer of straw for protection, or a snow cover would also serve the same purpose of providing insulation and to deflect harsh winds. Floating row covers could be another good option. That is all the care that these hardy plants require and it is possible that some types could survive the winters out in the open with no protection at all. These are heading lettuce varieties and by March they will begin to look the part as they send out a spurt of growth during late winter. Again just like the fall planted garlic there will be noticeable leaf gain when most other plants are still enjoying their winter slumber. 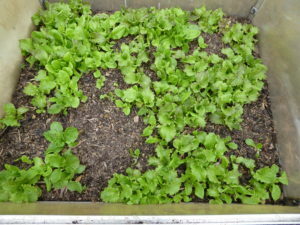 This is the time when the gardener really appreciates Winter Lettuce because the plants are so lush and more vibrant than any lettuce plants you could have started indoors. They are also perfectly acclimated to the outdoor environment since that is all they’ve known and there is no need for coddling the plants or for hardening them off as you would plants that were started inside or under lights. 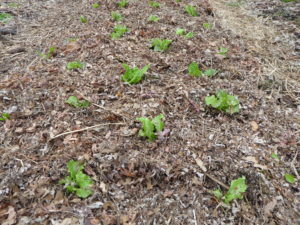 Mid-March is the time that I usually thin and transplant the patch of Winter Lettuce, and since I use raised garden beds I can conveniently transplant without the need for tilling or working the garden beds in advance. I can also get into the garden earlier than most gardeners and don’t need the soil to dry out at all, which is another bonus that comes in handy when it’s time to transplant Winter Lettuce. Simply dig down and loosen a five by five inch square of plants, carry to the new growing place, and gently separate the plants for replanting. You should find nice root growth on healthy plants with six or more true leaves. Set the transplants at the same depth that they were growing before and lightly firm them into the ground. 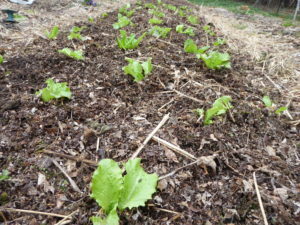 Then if desired you can mulch around the Winter Lettuce transplants with shredded leaves or chopped straw to restrict weed growth and conserve moisture. Because of the weather conditions during late winter and early spring I seldom notice any transplant shock and the plants should recover quickly from being moved and resume their rapid growth. I usually transplant before a rain but otherwise you may need to irrigate to help the plants adjust to their new setting. After transplanting it will only be a matter of a few weeks until the Winter Lettuce will be displaying nicely formed heads that can be harvested or left a little longer to reach full maturity. Leave a few heads until summer and the plants will produce seed to use for next fall’s planting and the cycle will continue. 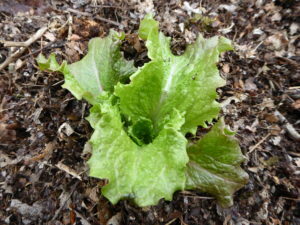 If you’d like to grow Winter Lettuce in your own garden start by searching for lettuce varieties that are bred for this purpose and that are hardy enough to survive winters without much care or protection. When I lived on the farm there was a no name “winter lettuce” that we planted under straw and saved seed for during the summer. I don’t have that seed anymore but have been able to locate varieties such as; Landi’s Winter, Maule’s Philadelphia, Eva Snader’s Brown Winter, and Red Tinged Winter Lettuce that I am putting to the same purpose as that proven generic winter lettuce that I used to grow. It may require a bit of trial and error to determine the timing and varieties of Winter Lettuce that will grow best for your growing region but it is worth the effort. Fall sown lettuce plants that enter into springtime are so healthy, vibrant, and in sync with the changing seasons that I believe they will outperform greenhouse produced transplants and provide an early harvest of gorgeous heads of homegrown lettuce. thank you so much, I love to garden and it’s actually my number 2 reason to buy a house with a backyard so I can grow vegetables.I ordered this landis winter lettuce online and while waiting for its delivery, I searched instruction on how to plant it and found yours.Thank you.I can’t wait to plant it.